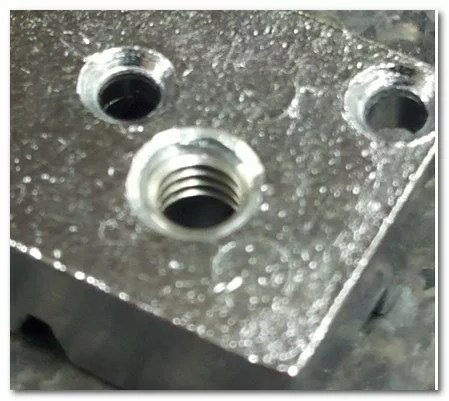 Helicoils are a quick way to repair a stripped out threaded hole, and since they are hardened steel use of a drill press for the first step is really the way to go. 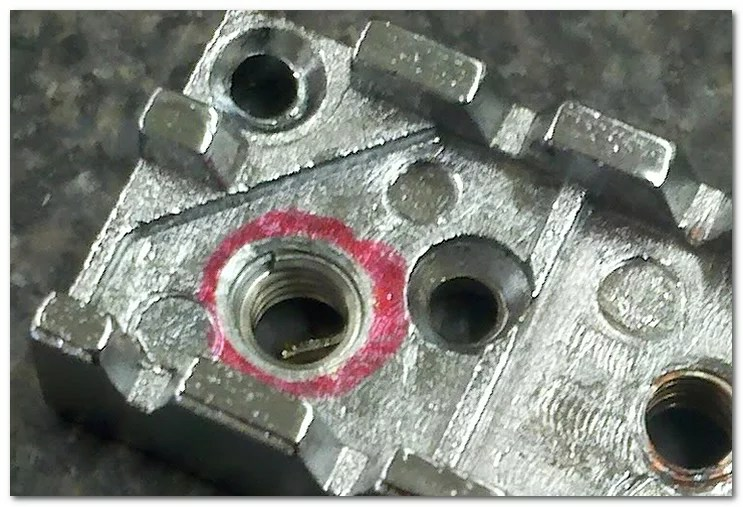 Drill out the damaged tapped hole marked in red. Re-tap the oversized hole with the provided oversized tap. I am doing this by hand using a homemade tap guide block to aid in keeping things plumb. Using a drop or two of cutting fluid, or even 3-in-1 oil will aid in a clean thread cut and also keep the chips clear while turning. 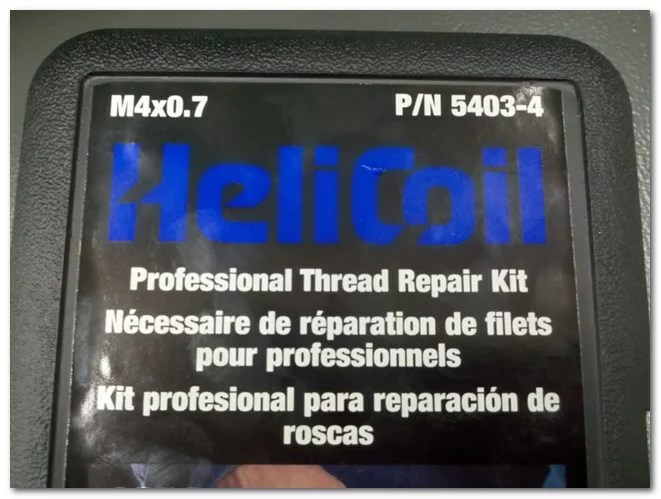 Here is the helicoil itself and the insertion tool provided in the kit… (pardon the blurry pics as I only had my cell phone). Here is the helicoil wound onto the insertion tool ready for installation. 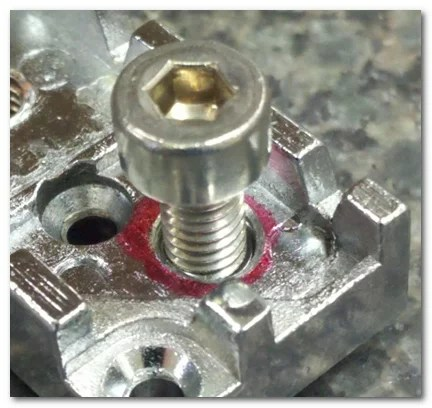 You screw it into the oversized threaded hole just as if it were a screw itself. Here is the repaired hole from the topside of the plate. You always work from the cavity side of the plate (top) towards the backside of the plate for all steps. Here is the repaired hole from the backside. 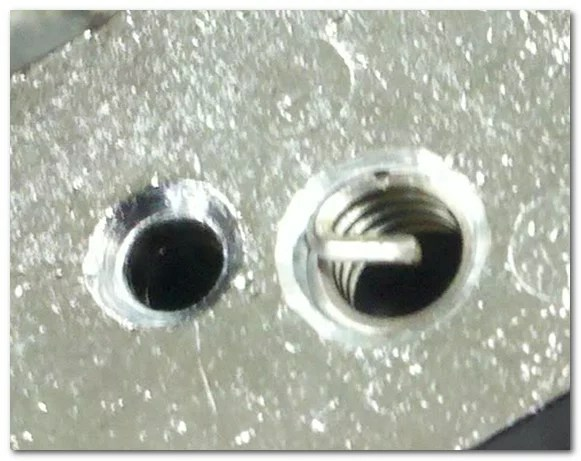 Note the small end turned 90° toward the hole center. That is what the insertion tool “grabs” to turn into the oversized hole. 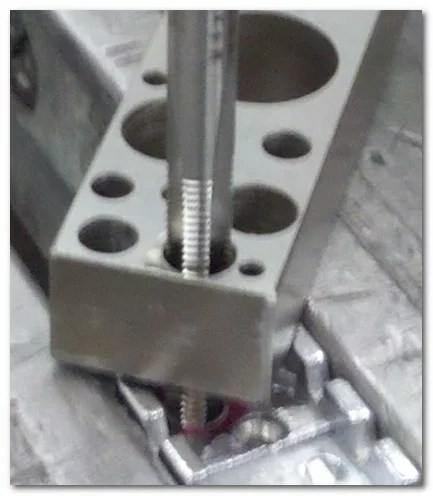 A drive pin slightly smaller than the minor diameter of the repaired hole is used to punch the 90° end off. 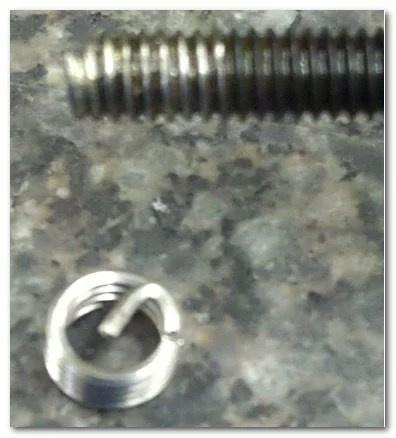 You may be able to see the pre-cut break on the coil winding in the last pic. The kit itself can be ordered from any online tool supply house and also from many auto parts stores, some even carry them. 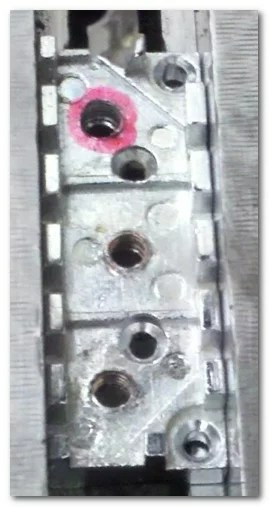 The repaired hole will be several factors better for holding strength and wear. 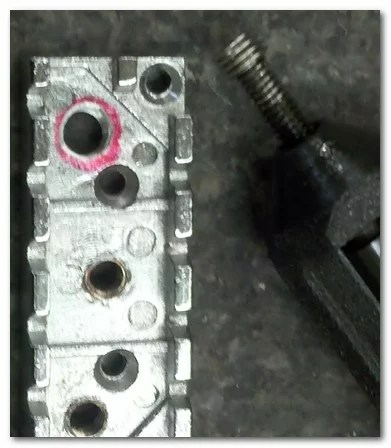 Since the plate is off the head stock now I will start with over-length screws and a sanding belt or offhand grinder to bring them under flush to the plate backside..